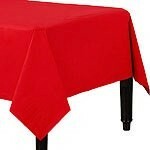 Parties can get messy – so cover your table with this plain paper tablecloth to protect it from spilled juice or sticky sweets. The absorbent tissue paper will stop spills spreading and the plastic backing prevents liquids seeping through to the table. It’ll look great with coordinating tableware too.